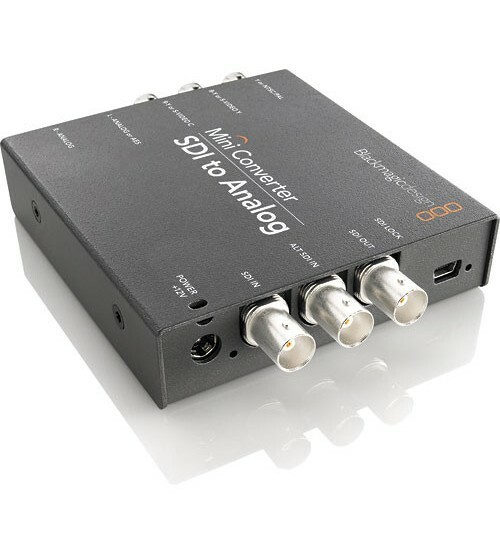 The Mini Converter SDI to Analog from Blackmagic will accept an SDI input signal and convert it to HD/SD component, NTSC, PAL, or S-video output. Also, if your SDI signal has audio embedded, the Converter will let you first de-embed the audio so that you can output it via the analog outs. Use this device to convert SDI video signals to analog output. The Converter can de-embed audio from an SDI signal so that you can output it via the analog outs.